The 2017 Spring Branson auction was missing a key element: Mark Trimble. Mark died February 11, probably while planning on doing aerobatics in the air over the Ozarks. He was dedicated to Branson, but more than that to living a good, fulsome, life. He brought the Branson Collector Car Auction to life nearly 40 years ago, passing it on to his friends Jim and Kathy Cox nearly 30 years ago for a dollar. Jim still recounts how it cost him a couple hundred thousand dollars in the first years. They persisted through ups and downs at the Mel T-t-t-tillis Theater, Tri-Lakes Center, Chateau on the Lake, Celebration City, and since 2007 at the Convention Center at Branson Landing despite tornadoes. It’s surprising to me that since 2001 I’ve been introducing cars on the Branson auction block. It’s been sixteen years, but way less than half the Branson Auction’s history. With both Mark Trimble and the Coxes the Branson Collector Car Auction has always been about more than commercial success. They have exulted in the cars, the collectors and the people – including Branson celebrities and entertainers – who participated. Branson Auction regulars have become friends, sharing experiences, triumphs, disappointments and family milestones. None was more poignant than Mark Trimble’s passing but in counterpoint this year also marked the birth of Jim and Cathy’s first grandchild to Brandon and Donna, impresarios of the sadly missed, tornado destroyed, Candlestick Restaurant. Car collecting is like that. Friends, colleagues, collections and acquaintances come and go. 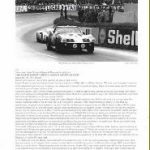 The cars continue, a constant of fascination, intrigue and passion. 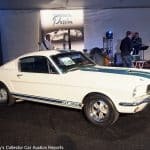 Mark Trimble is (not “will be”) missed but his enthusiasm for cars was embodied in this year’s Branson Spring Auction by Jim Cox’s adoption of a different approach to some of the cars. There is so much focus on mega-dollar results, on cars that are fascinating but not even remotely approachable by anyone without a multi-hundred million dollar liquid net worth. Who is going to educate youngsters in the mysteries of “intake-compression-power-exhaust” and the essential elements of “fuel-air-compression-ignition” that make cars work? It’s not going to happen with mega-buck Ferraris or even rare Corvettes. They’re too valuable to let anyone but experienced techs with bazillion dollar Snap-On cabinets touch them. Instead, Jim brought a couple dozen really ordinary cars (some of which are described later) to Branson. Jim dragged them out of barns, garages and fields in Middle America. Brought to the techs at Jack Martin’s shop at Branson Collector Cars, they got triaged. At the auction they started, drove, turned and stopped. For mid-four figures there were cars that could be entrusted to the kid next door, a niece or a grandkid to maintain, improve and apply the principles of “fuel-air-compression-ignition” with minimal financial risk but maximal potential psychic return. At Friday morning’s pre-auction meeting we chased a term that would describe them. “Entry Level” collector cars was descriptive, but seemed pejorative. 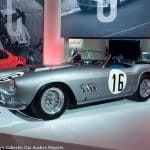 “Affordable” was far too erratic and resource-related; an “affordable” Ferrari 250 GT is not – to most collectors – “affordable”. After some consideration we settled on “Gateway cars”, as in the gateway to understanding how cars work, what collecting cars is about, the accomplishment of making old mechanical devices work as intended and pride in actually using something that performs as its caretaker and the original designers intended. 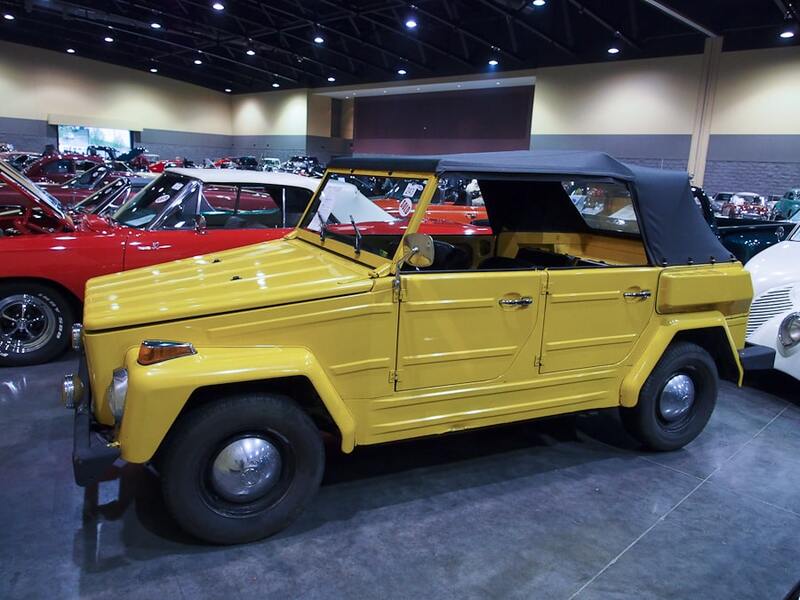 Lot # 243 1974 Volkswagen Thing Convertible; S/N 1842469791; Engine # AM023199; Yellow/Black vinyl; Black vinyl top; Visually maintained, largely original, 3- condition; Hammered Sold at $8,500 plus commission of 10.00%; Final Price $9,350 . With Reserve. – Black wheels, hubcaps, fog lights, side curtains, new Yokohama tires. – Resprayed assembled with abundant overspray and negligible masking. Chips on nearly every moving surface. Sound old (original?) upholstery with a tear on top of the driver’s seat back. Good top. Orderly engine compartment. Grungy chassis and underbody. A utilitarian Thing. – But a Thing that is good at the things Things are good for, like cruising to the lake or out for an ice cream on a fine evening. Dirty dog paws, spilled ice cream cone? No problem: just hose it out. It is economical to operate, parts are plentiful and there is no shortage of friendly advice on how to maintain it, an ideal gateway car for trying out car collecting. The successful bid here is only $20 more than its all-in price here twelve years ago. Lot # 245 1928 Ford Model A Roadster; S/N A530253; Dark Green/Brown leatherette; No top; Older restoration, 3- condition; Hammered Sold at $11,500 plus commission of 10.00%; Final Price $12,650 . No Reserve. 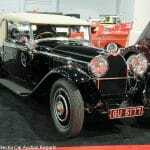 – Wind wings, Cream wire wheels whitewalls, dual sidemounts, rumble seat. – Sound but poor old paint with dust and dirt inclusions, erratic chrome, sound but aged upholstery and trim. Unrestored gauge panel and steering wheel. Good glass. 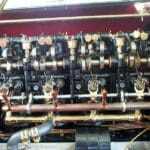 Superficially restored engine and chassis. A sound and drivable Model A done to the standards of generations ago, No prize, but too good to do over. – Sold here three years ago for $9,720 and it is hard to conceive it might be better today than it was then. It’s just good enough that spending more than a little time and money on it would be unrewarded, but that doesn’t make it any less fun to own and drive (at least until the absence of a top becomes an issue in a sudden shower.) This is all the money it deserved to bring and the seller should be delighted with the result. 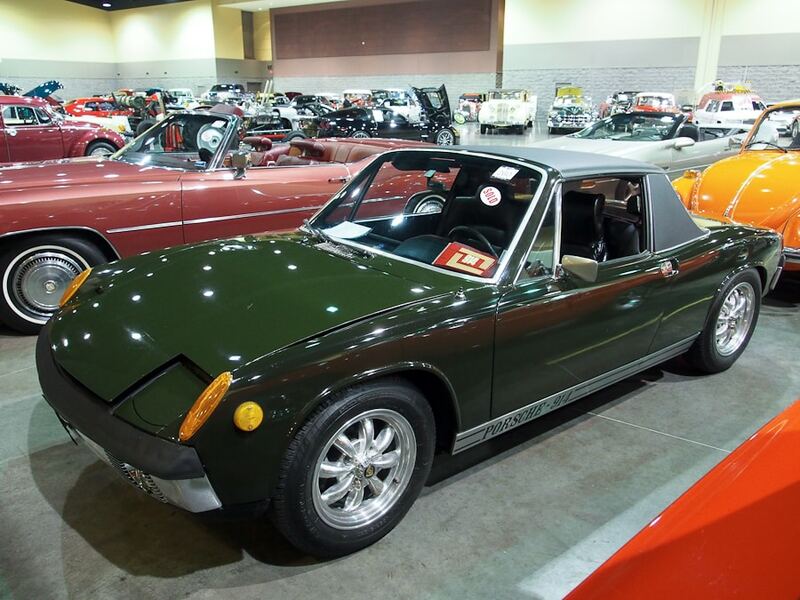 Lot # 260 1971 Porsche 914 Targa; S/N 4712905003; Olive Green/Black vinyl; top; Visually maintained, largely original, 3 condition; Hammered Sold at $13,750 plus commission of 10.00%; Final Price $15,125 . With Reserve. – 1,679/85hp, 5-speed, AutoMeter clock, voltage and oil temp gauges in the console stack, Radio Shack stereo, 8-spoke polished alloy wheels, no-name radial tires, black vinyl covered roof panel and Targa bar, owner’s manual. – Flawed old repaint applied over old paint with dirt and dust embedded in it. Worn original interior with scabs on the driver’s seat back bolster. Reasonably clean and orderly underbody and engine compartment. A sound driver or reasonable basis for a straightforward restoration. 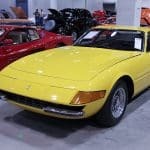 – There was a suggestion this 914 might once have been part of the Drendel family collection, but it didn’t make it into the dispersal sale at Gooding’s Amelia Island auction in 2012. It does rise to the standard of a decent driver and will get its new owner into many Porsche Club activities at an affordable, but generous, price. Lot # 270 1973 Volkswagen Beetle Convertible; S/N 1532465712; Engine # AE888535; Orange/Black vinyl; Cream vinyl top; Unrestored original, 3- condition; Hammered Sold at $6,000 plus commission of 10.00%; Final Price $6,600 . No Reserve. – Sapphire VIII pushbutton radio, four new Cooper tires, three hubcaps. – Sound original paint with several scrapes on the nose. Pitted and thin original chrome. Stiff original upholstery with tears on the passenger’s seat, stiff old top. Orderly underbody has had some new undercoat quickly applied. Dirty but orderly original engine compartment. Rusty top structure. Missing the right rear beltline chrome molding. Sound body. Some simple, but not necessarily inexpensive, cosmetic attention will raise the level of this VW a lot. – Like the Thing that sold earlier today, this is an ideal gateway into car collecting: simple to maintain, ready parts availability and enjoyable to use three seasons of the year. With some TLC and a few easily found upgrades it could be worth a lot more. “A lot” is relative, where a 100% value improvement is but $7,000 to cover a new top, some paint on the top frame, selective chrome and seat covers. But think of the kids’ pleasure in participating in the exercise. 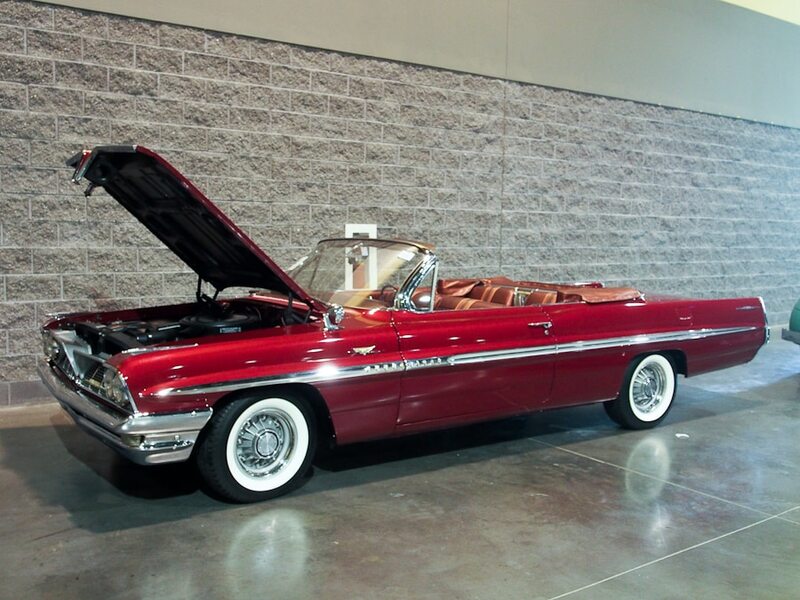 Lot # 276 1963 Chevrolet Corvair Monza Convertible; S/N 30967W228345; Dark Red, Monza/Dark Red vinyl; White vinyl top; Visually maintained, largely original, 3- condition; Hammered Sold at $5,500 plus commission of 10.00%; Final Price $6,050 . No Reserve. 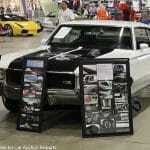 – 4-speed, cassette stereo, wire wheel covers, narrow whitewalls, chrome shift knob. – Poor repaint while assembled with big scuffs and scrapes on the left front. Scuffed, dirty old chrome. The upholstery has been coated but the coating is peeling like a bad sunburn. Dirty underbody with original undercoat. Vinyl wrapped steering wheel. Tacky underdash speakers for the equally tacky cheapo cassette stereo. Dirty but not disreputable engine compartment. Sound body. Needs a lot, but not all at once and is an eminently manageable enthusiast restoration project. – One of the Branson Auction’s “Gateway” cars, an economical and surprisingly sound entry into collecting with more than a little going for it in style and rarity and a manageable project for some continuing attention to add value (of which the first thing will be to scrub off the scrofulous coating on the seats.) It runs, drives and stops; some more use will identify its weak points but along the way it will be a pleasing driver that won’t break its new owner. 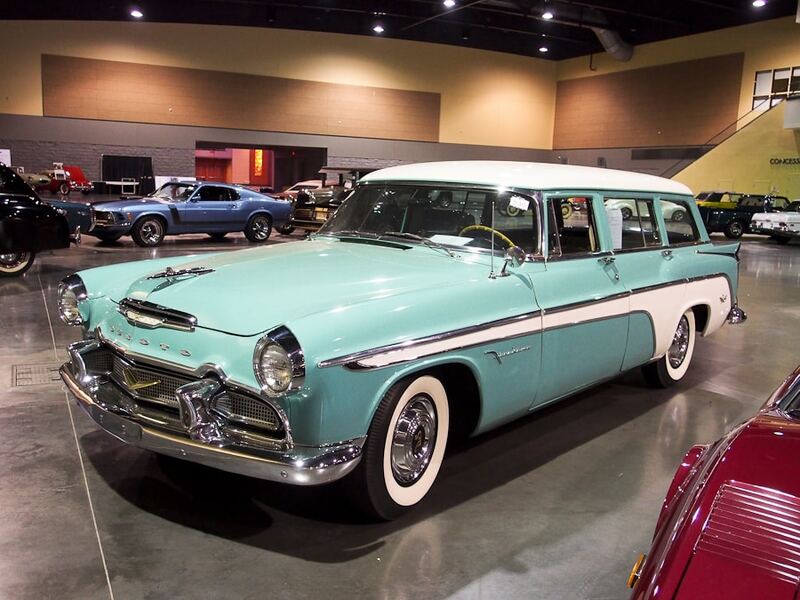 Lot # 530 1956 DeSoto Firedome Station Wagon; S/N 55323077; Turquoise, White roof/Beige cloth; top; Visually maintained, largely original, 3- condition; Hammered Sold at $19,250 plus commission of 10.00%; Final Price $21,175 . With Reserve. – 330/230hp, 2-barrel, pushbutton automatic, power steering, power brakes, 3-row seating, pushbutton radio, wheel covers, whitewalls. – Mediocre old repaint with overspray in the engine compartment and chips around the hood. Scuffed and scratched chrome, sound upholstery and interior trim. Dirty original underbody. Engine compartment has been cleaned up and given a quick rattle can touchup. Driver’s door exterior handle is falling off. Wiring is old with stiff insulation and more than a few exposed conductors. Very Fifties but also very needy. – Offered here in 2008 with a reported high bid of $29,000, this is a nifty Fifty’s family wagon and it brought a price that is no more nor less than its rather aged originality and compromised condition warranted. The wiring under the hood is scary, but the little 2-barrel Hemi is charming. Lot # 542 1925 Pierce-Arrow Model 80 2-Dr. Sedan; S/N 808184; Green, Dark Green fenders and roof/Green, Grey cloth; top; Older restoration, 3- condition; Hammered Sold at $24,500 plus commission of 10.00%; Final Price $26,950. With Reserve. – 289/70hp six, 3-speed, 22-inch wood spoke body color wheels, blackwall tires, windshield visor, pulldown shades in the rear windows, rear-mounted spare, luggage trunk with two original fitted cases, wood steering wheel, Dawley headlights. – Sound but old paint with some cracking along the beltline creases. Upholstery has some tears but is now preserved under clear plastic covers. Chassis and underbody are old and dirty. Sound body, even gaps, flush fits. Flaky radiator shell chrome and weak trim chrome. A tired and aged but sound old restoration. – The Model 80 was introduced in 1925 to compete with less expensive luxury models, particularly the Packard Single Six, combining Pierce quality with a less expensive drivetrain. 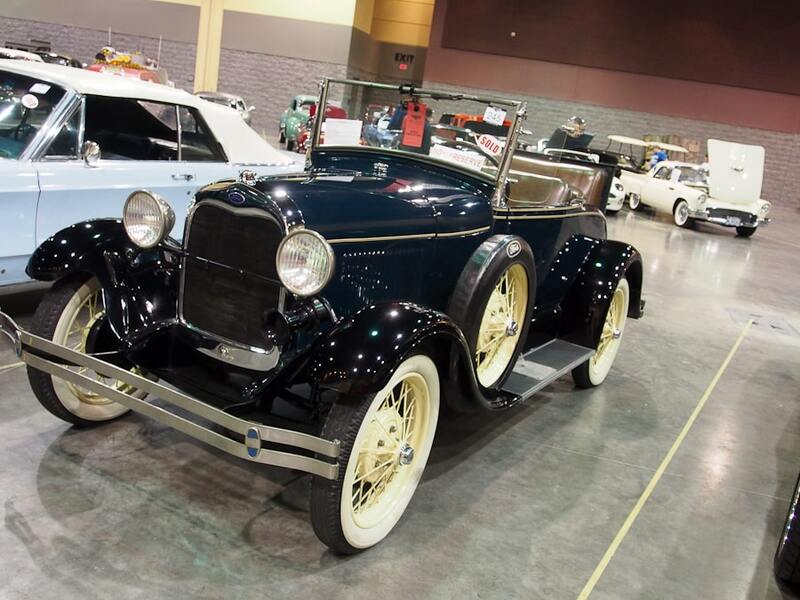 This ’25 Model 80 exemplifies the target market with sedate, erect 2-door coachwork (the French would have called it a “Coach”) with fine details like the discrete window shades. It was bid to only $14,000 here in 2010 but brought a realistic price today appropriate to its quality, style and CCCA Full Classic ™ stature. 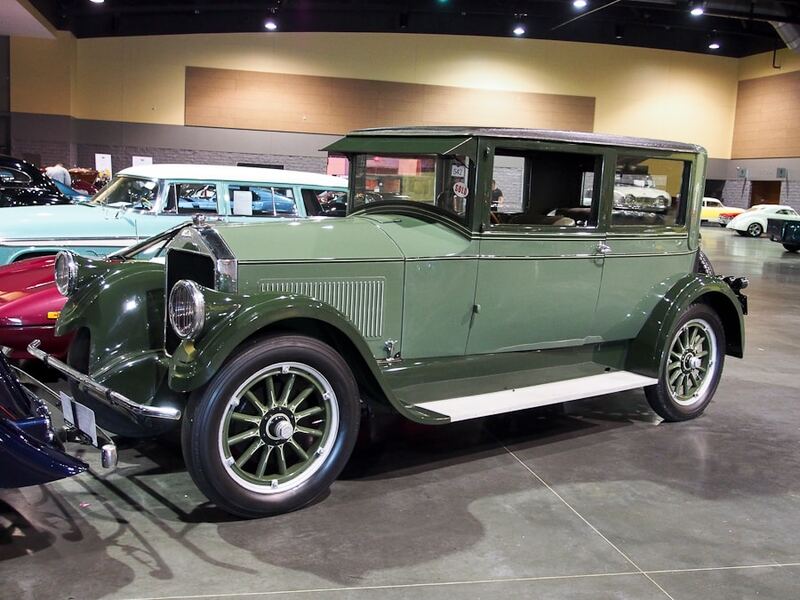 It won’t win any awards for its condition, but it will eloquently express Pierce-Arrow style on tours, for no more than good Model T Ford money. That is a serious value. Lot # 555 1940 Chrysler Windsor 4-Dr. Sedan; S/N 6982228; Black/Gray cloth; top; Visually maintained, largely original, 3- condition; Hammered Sold at $6,700 plus commission of 10.00%; Final Price $7,370. With Reserve. – 241/112hp six, 3-speed with overdrive, accessory turn signals, pushbutton radio, skirts, heater, necker’s knob, red wheels, hubcaps, trim rings, fog lights, bumper overriders, bud vases, evaporative window mounted air cooler. – Poor pimply old repaint, sound upholstery and interior trim. Sound chrome except for the fog light housings. Decent gauges and dashboard except for cracked radio pushbuttons. Delaminating driver’s vent window. Sound body, good panel and door fits. Dirty but dry original underbody. – Gold Seal powered with 112hp and overdrive, this was a six to be considered in 1940. In 2017 it is just big, which isn’t a knock on it. There’s room in the back for a party with a passel of grandkids and their friends who will delight being picked up at school in this proto-SUV. 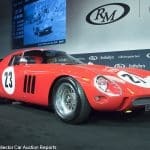 It’s another of the Branson Auction’s gateways to car collecting: simple, solid and attention-getting for a price that almost any grandpa or Dutch Uncle can afford to educate their little understudies. Will it be driven with pride? Yes, but it’s pride in keeping it going rather than pride in what it is. 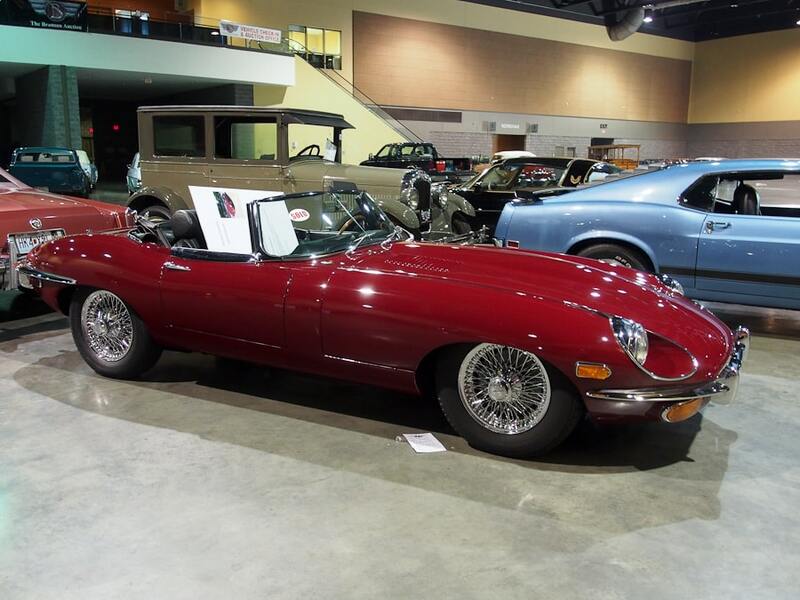 Lot # 563 1969 Jaguar XKE Series II Roadster; S/N 1R8894; Maroon/Black leather; Black leatherette top; Visually maintained, largely original, 3 condition; Hammered Sold at $50,000 plus commission of 10.00%; Final Price $55,000. With Reserve. – 4-speed, Philips multiband radio, chrome wire wheels, Michelin XVS tires, woodrim steering wheel, JDHT certificate documented. – Mediocre repaint, poorly masked and with abundant fisheyes and dust. Good chrome and new upholstery. Wheel wells repainted over old undercoat. A haphazard redo. – This E-type looks good from 30 feet (farther than the usual 20-footer) but loses much of its appeal upon a closer look. It’s had superficial attention and the seller should be happy to get this much for it. 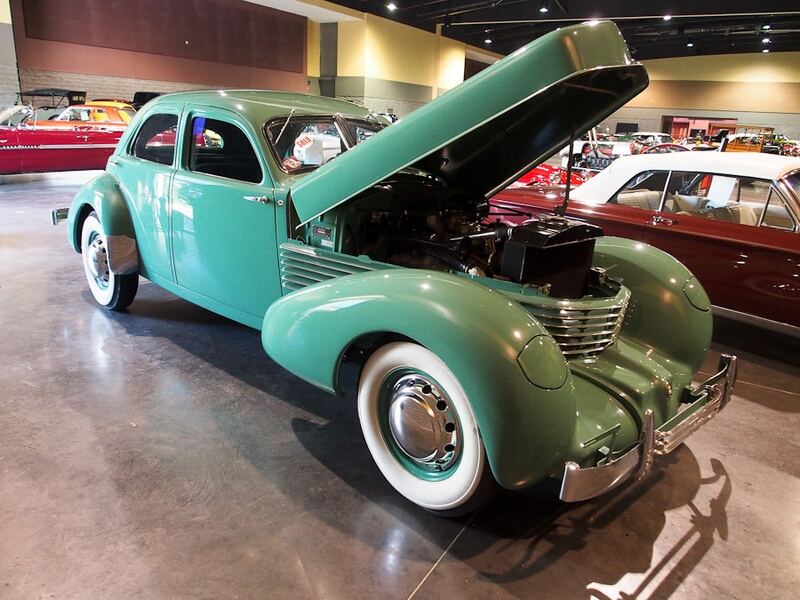 Lot # 564 1937 Cord 812 4-Dr. Sedan Westchester; S/N 1471A; Engine # FB1960; Light Green/Dark Green cloth; top; Older restoration, 3+ condition; Hammered Sold at $56,500 plus commission of 10.00%; Final Price $62,150. With Reserve. – Radio, hubcaps, wide whitewalls, bolt-on trunk. – CCCA National First Prize # 992. Good older paint, chrome and interior. A quality old restoration with more age than miles. – One of only two known bolt-on bustle trunk Westchesters, the other was Mrs. E.L. Cord’s personal car. Restored in the 1980’s, it’s not been driven much since then but the restoration’s age is apparent everywhere. It was sold here in 2012 for $65,100 and the price today is indicative of its preservation. 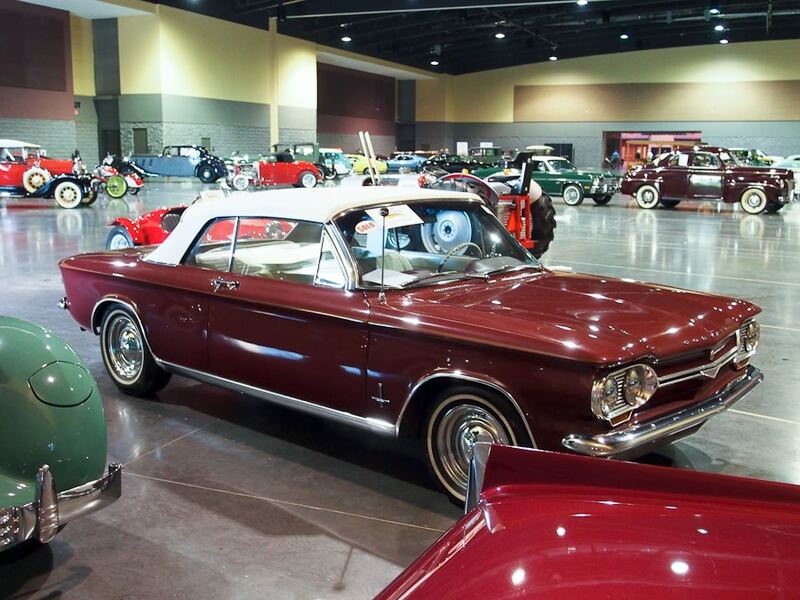 Lot # 586 1964 Chevrolet Corvair Monza 990 Convertible; S/N 40967W112441; Maroon/White vinyl; White vinyl top; Visually maintained, largely original, 3 condition; Hammered Sold at $6,500 plus commission of 10.00%; Final Price $7,150. With Reserve. – 4-speed, pushbutton radio, KnightKit 90 degree electronic tach, chrome reversed wheels, hubcaps, narrow whitewall Hankook radial tires, dual carbs. – Sound older repaint, interior and top. Weak chrome. Underbody has dirty original undercoat. Engine compartment is original but surprisingly orderly. Poorly touched up scratch on the right hood. Flat panels, flush fits and even gaps all around. 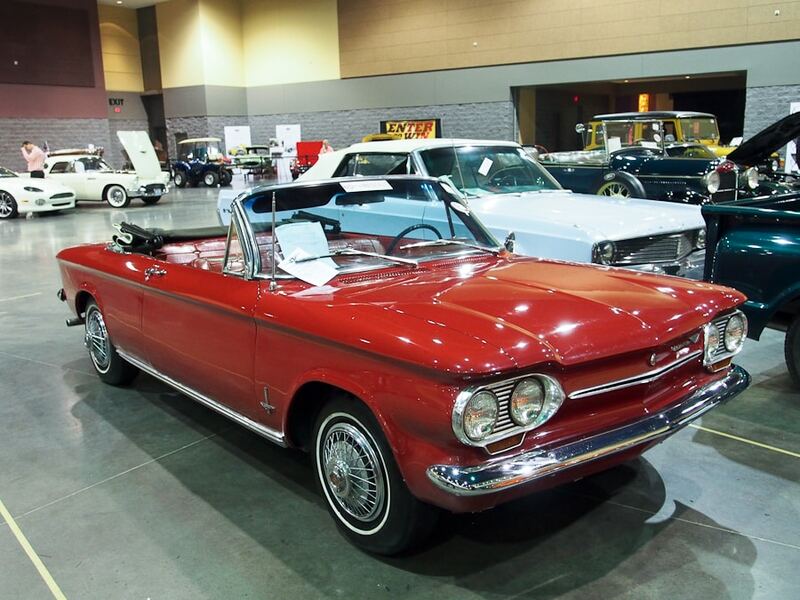 An unusually good Corvair. – The price this Monza convertible brought is modest by a few thousand dollars, but its charm is vastly enhanced by the KnightKit tach, a relic of the nascent days of the electronic era in the early 60’s when Allied Radio, Heathkit and Radio Shack competed to intrigue budding technologists with electromechanical and tube electronics. [I’m listening to Classic Rock on WXRB-FM on a Fisher TX-50 transistor amp, a miracle of its time, and a pair of Wharfedale W70s, and that is “old school.”] This is a better car than the price it brought. 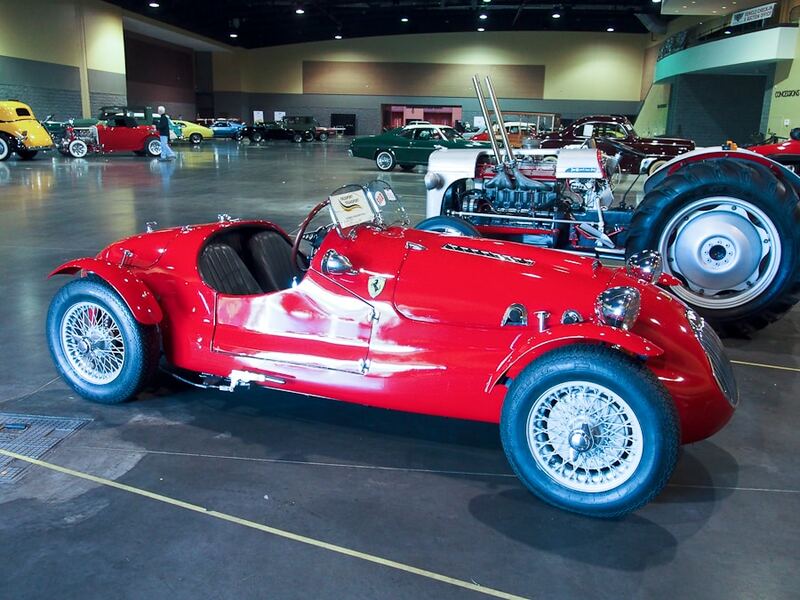 Lot # 592 1948 Ferrari Replica 166 Spyder Corsa; S/N 1D48404COLO; Red/Black; top; Facsimile restoration, 3+ condition; b. With Reserve. – Tube chassis, TR6 power, overdrive, disc brakes, Alfetta deDion rear suspension, dual aeroscreens, chrome wire wheels, coil spring front suspension, SF shields, Ferrari nose badge. – Good older paint, chrome and interior. – There is nothing “Ferrari” about this replica, but it is well done and in good condition. It’ll make a better impression at a British car show than an Italian one where it will be rejected at the gate by any informed scrutineer. The chrome hood vents would send Enzo into catatonic shock. A fun driver in good condition, it’s not a bad buy at this price, if the buyer’s ego can stand up to the approbation for such an abject fake. Lot # 608 1975 Plymouth Duster 2-Dr. Sedan; S/N VH29G5G111374; Green, White vinyl roof/Green vinyl; top; Unrestored original, 3 condition; Hammered Sold at $5,750 plus commission of 10.00%; Final Price $6,325. With Reserve. – 318/145hp, 2-barrel, automatic, power front disc brakes, power steering, air conditioning, AM-FM, chrome wire wheels, narrow whitewalls. – Sound but scuffed and swirled original paint. Sound original chrome, interior and roof vinyl. Dirty original engine compartment and underbody. Unexceptional and unloved but sound and original. – This is just a car, but a delightfully original and well-equipped one from the post-1972 era of realistic power ratings. A misogynist might characterize it as a “secretary’s car'” but that doesn’t do it justice. 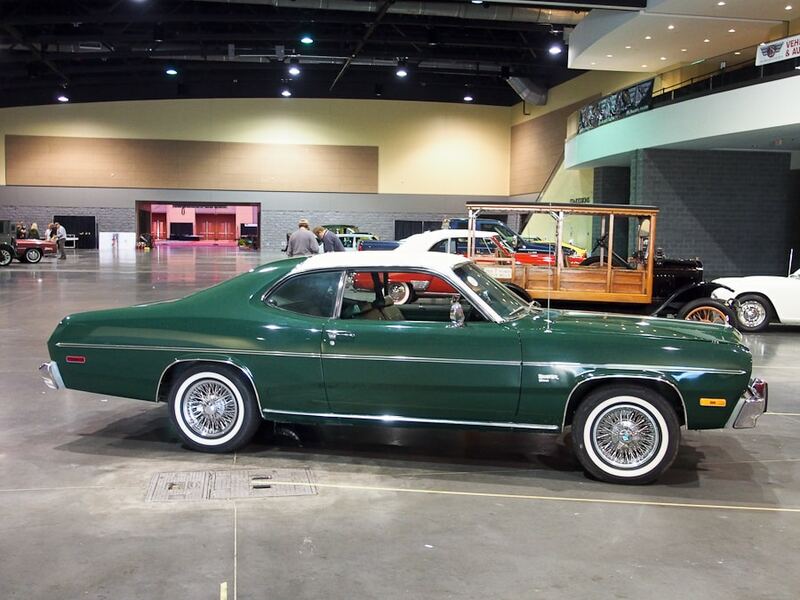 It isn’t necessary to spend a lot of money on a collector car, and originality and equipment make this a collector car. 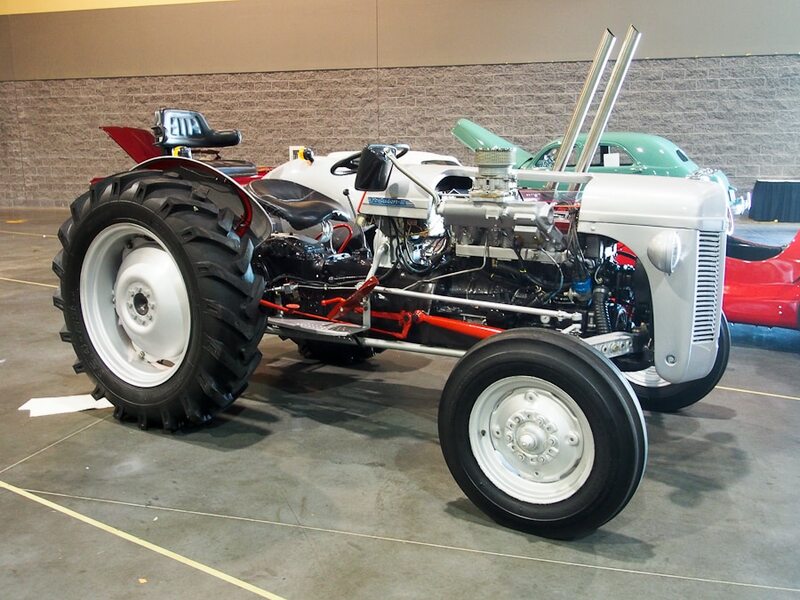 Lot # 625 1953 Ferguson Custom Built Tractor; S/N TO-110776; Silver, Red/Black vinyl; top; Customized restoration, 2+ condition; Hammered Sold at $11,400 plus commission of 10.00%; Final Price $12,540. With Reserve. – 4.2 liter Jaguar six out of an ’85 XJ6 Vanden Plas, Rochester Quadrajet on the modified FI manifold, zoomy exhaust pipes on reversed XJ6 cast headers, overdrive 4-speed, GPS, two radiators to keep it cool (with dual coolant temperature gauges reading in and out of the cooling system), comprehensively instrumented, buddy seat over the diamond plate rear-mounted fuel tank. – Incredibly ingenious and neatly built to Pebble Beach standards. The owner said, “I wanted something unusual and thought about putting a V-8 in it. My neighbor said, ‘I have a better idea, a Jaguar six. '” The rest is in evidence here and no one at Branson who loves vehicles missed its appeal. It started in a heartbeat, idled like a baby, and sounded like a banshee. The owner said it would go 50 mph but was hard to ride at that speed (probably harmonics on the vee-treaded drive tires) and cruised comfortably at 40mph. An astoundingly original creation in impeccable condition. – The reserve on this creation was only $5,000, a number the bidders left behind in the heartbeat it took to start it up. It was so thoughtfully and completely integrated that I asked the owner, “Are you an engineer?” He replied, “No”, which is what hot rodding is all about. This was an amazing creation, although the Ferguson System implement mount has been lost in the construction, a small price to pay for what it is. Why do it? Because you can. The owner was nearly in tears when the bidders endorsed his creativity and craftsmanship with this result, which is no more than it deserved to bring. I spent 15 minutes or so talking with the owner about it in the preview and later discovered that I was far from alone in giving it so much attention. It captivated a large segment of the Branson contingent, who know creativity and craftsmanship when they see it.